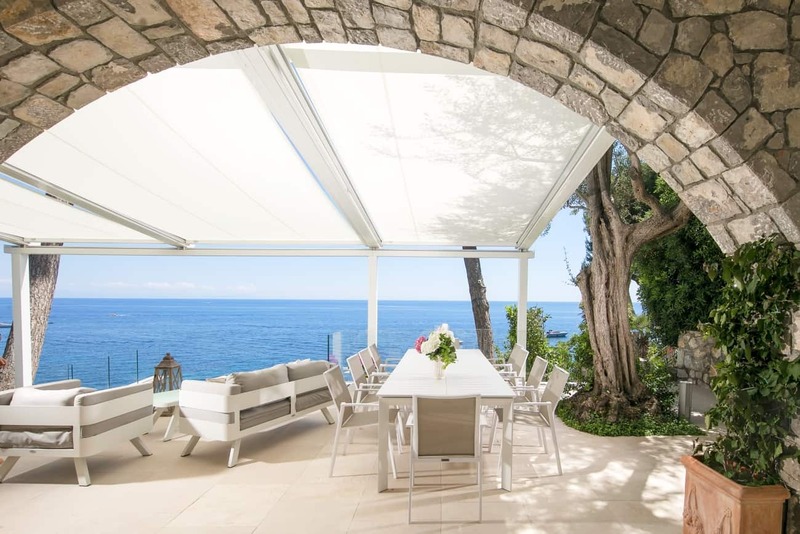 Welcome to Villa Angela, a wonderful two-storey luxury villa, overlooking the sea and surrounded by large terraces in the Amalfi Coast. The outdoor infinity pool is framed by two-centuries-old maritime pines and it equipped with hydromassage seats, perfect area where to relax and enjoy the surrounding flower garden. 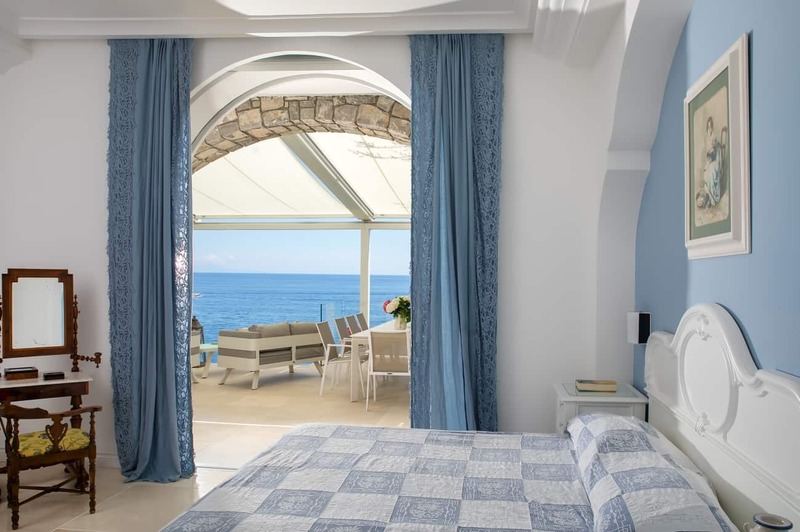 The six suites boast spectacular views over Marina del Cantone and the “Li Galli” islands. 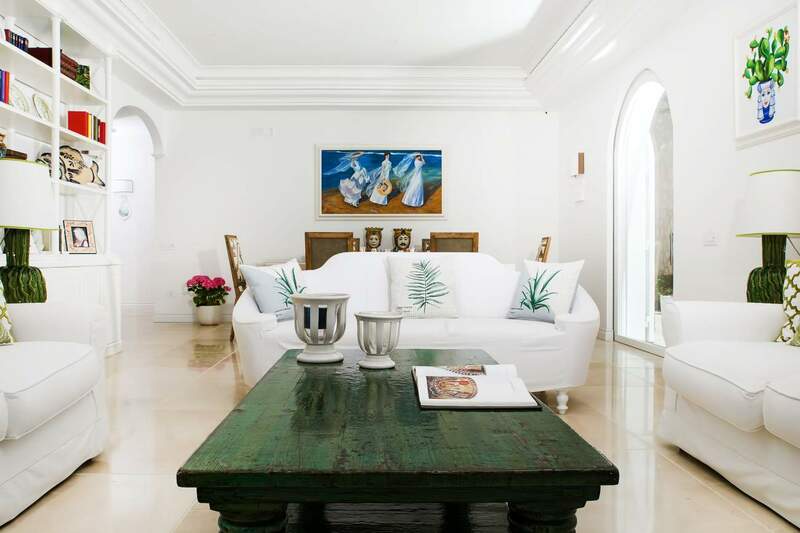 Villa Angela, a 2152 square feet property, is elegant and its design is classic. 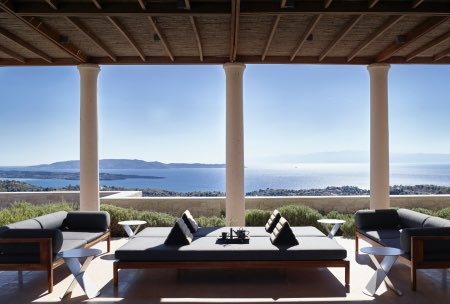 What we love about this luxury home are the panoramic terrace gardens descending towards the seas. 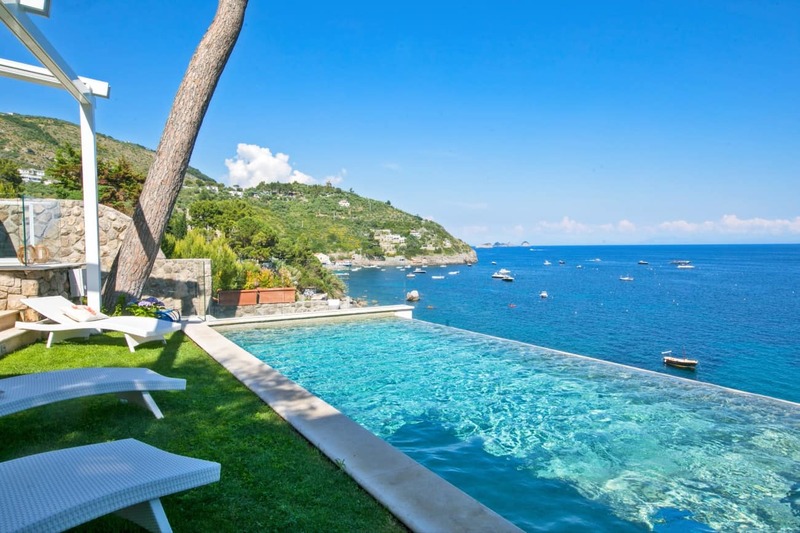 Staying at this villa you have private access to the sea also available by private cable car as well as private parking, which is something not easy to have in the Amalfi Coast. The system of the air conditioning is innovative, the owner implemented the circulation system; heating, and free Wi-Fi are also included. 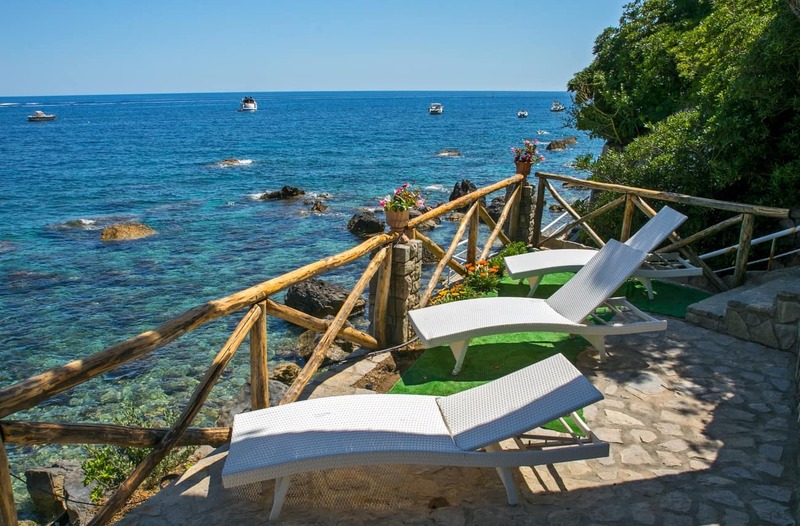 The nearest beach from the villa is the beach at Cantone. 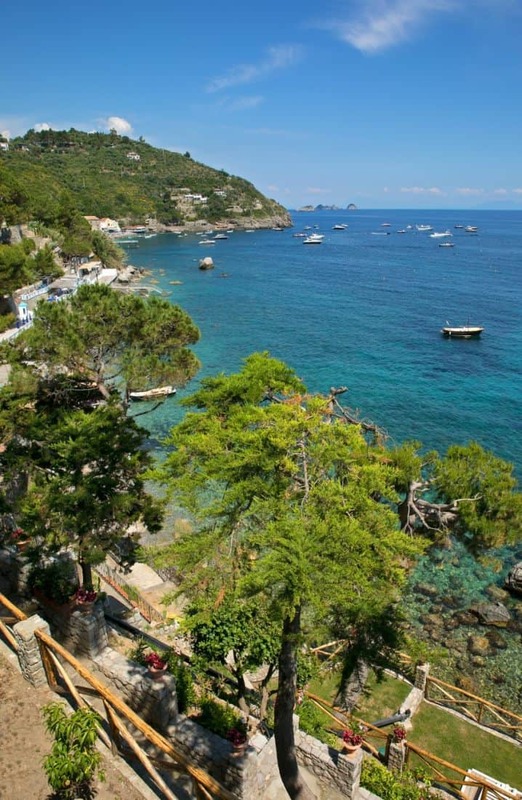 Cantone was an ancient fishing village, that today is very popular from tourists, the small centre has villas, hotels, and some of the best Michelin-starred restaurants on the peninsula. 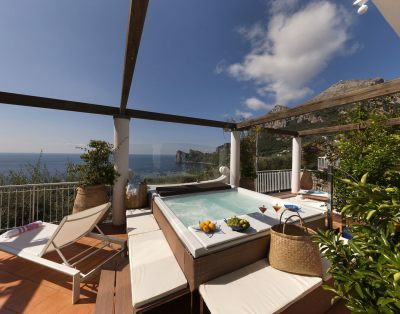 Villa Angela is truly the perfect luxury retreat where you will enjoy your vacation in the Amalfi Coast. 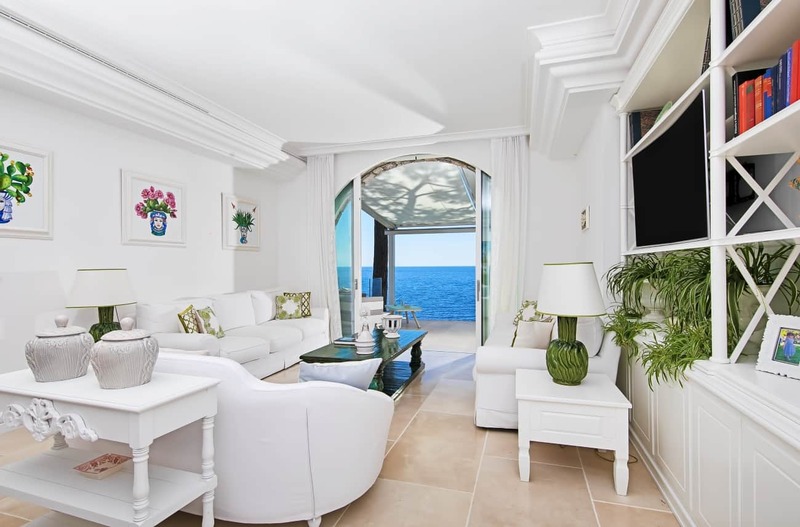 The underwater caves, the crystal sea, local hospitality and the green of the surrounding coast make this luxury villa a wonderful place for your holiday year round. 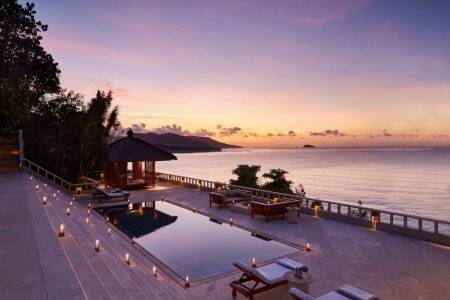 The villa looks out over the sea. As a result, the view from the amazing infinity pool is pure sea and sky. It’s a view which, with the enchanting sight of Marina del Cantone and the “Li Galli” islands, unleashes the desire to dive into the transparent water of thousands of colours, as you imagine meeting the Sirens who once lived there. You can reach the beach either by private cable car, or by foot, enjoying a pleasant and scenic walk. 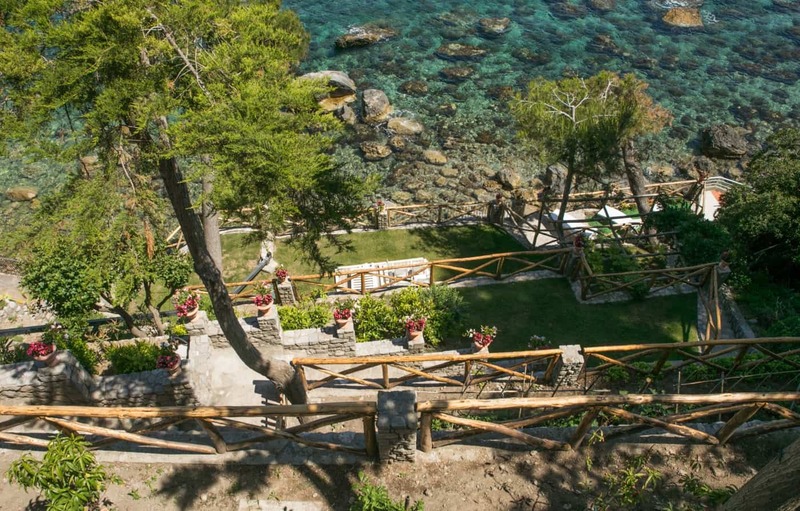 Through the various terrace gardens, down the stone steps, lined with panoramic terraces (furnished with chairs, loungers, outdoor showers, and covered gazebo) and gently descending facing the sea, you’ll enjoy the intense green colour of the grassland and the scent of the abundant and colourful flowers all around. 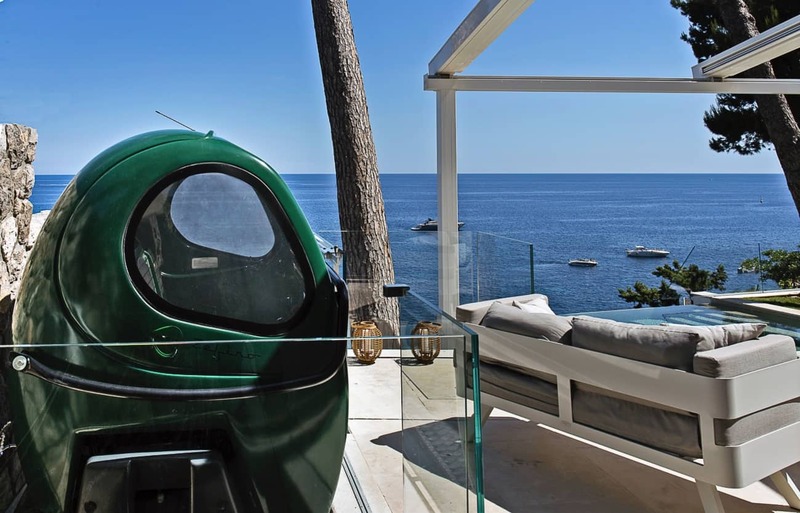 When you arrive at the pebble beach, you will have the possibility to make use of the services of the neighbouring lido. From the photos you can appreciate the elegance with which the large living room and four bedrooms have been furnished. 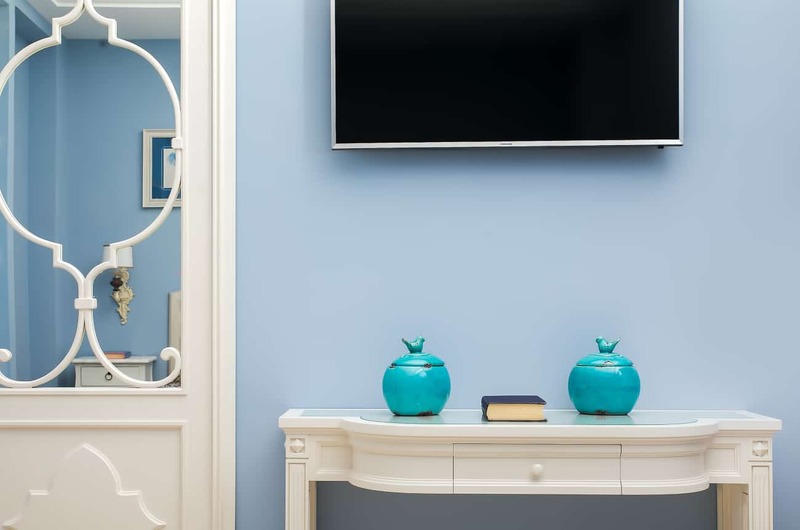 Living in this house you will feel the love that the owners have put into the attention to detail, the beautiful taste, and the luxurious harmony they have managed to create. 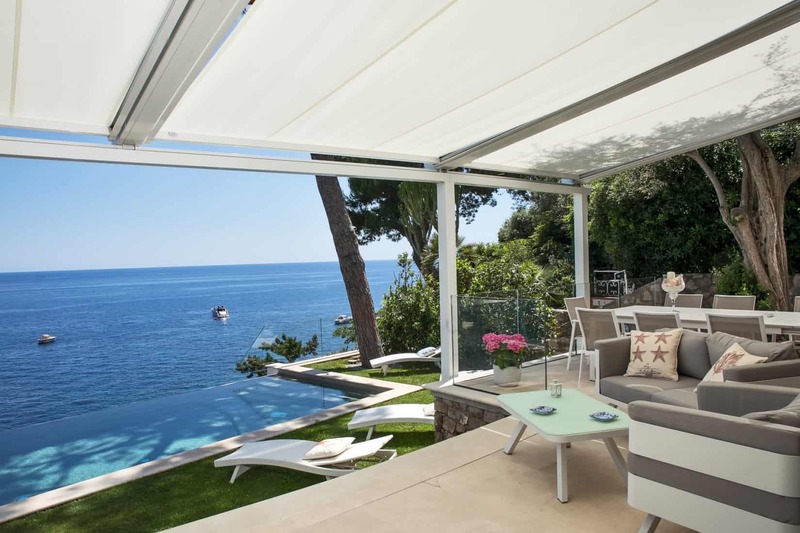 The villa boasts large outdoor spaces of around 500 square meters overall, which allows you to enjoy maximum privacy. 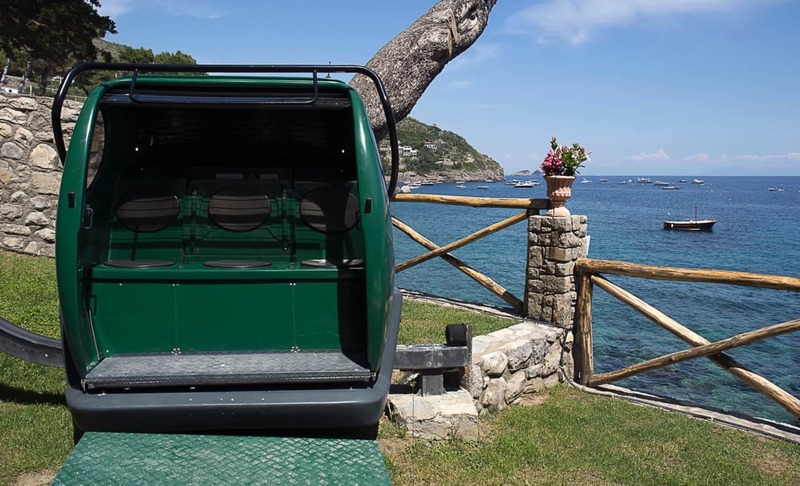 You won’t need a car to stay at Villa Ibiscus, but if you arrive by car you’ll be able to park for free in the private parking area inside the gate. 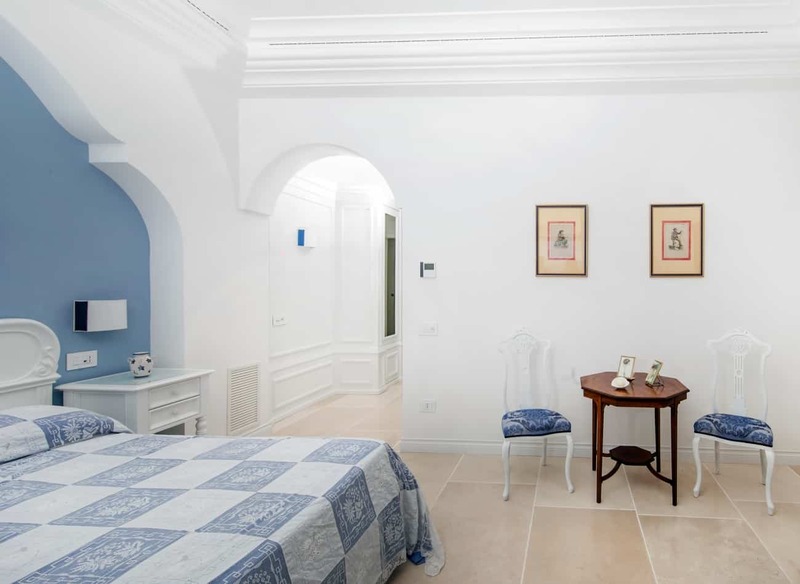 You reach the villa from the parking area and the entrance gate either by taking the private lift, or by climbing up an outdoor staircase of around 30 small steps. The parking is for 2 cars. 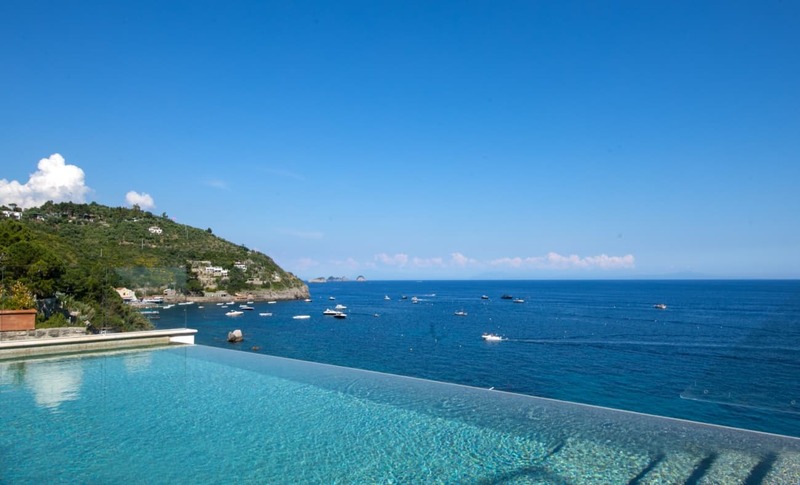 THE PRIVATE INFINITY POOL is positioned directly overlooking the sea, fitted with hydromassage seats, and is 3.9 m wide, 9 m long, and from 1.2 to 1.7 m deep. The grass border looking over the pool is furnished with sun loungers and fitted with a hot outdoor shower. 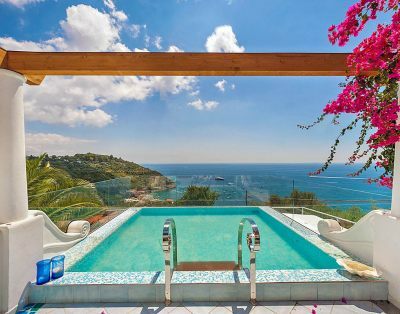 From the pool you’ll enjoy a spectacular view of the sea, Marina del Cantone, and the “Li Galli” islands. The pool is open from mid-April until the end of October and is accessed from the patio in front of the living room, up a wide staircase of just three steps made of Trani stone, which leads into the lawn garden overlooking the pool. 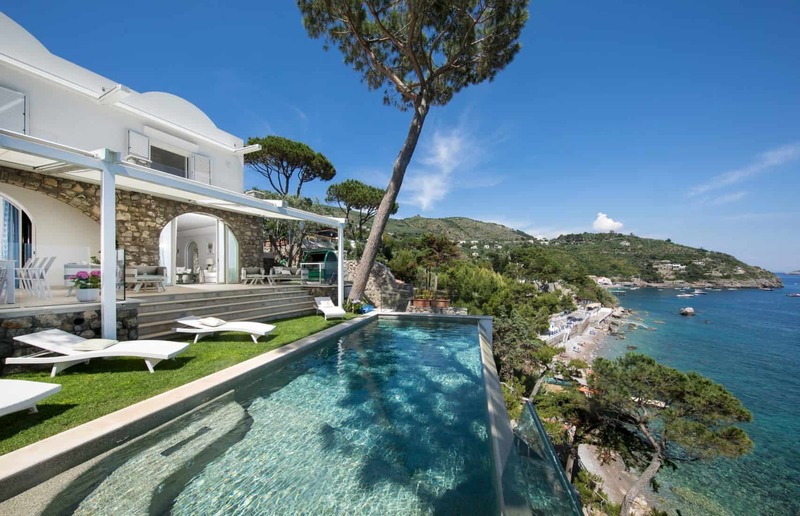 The terrace on the ground floor surrounding the villa is around 140 square meters in size. 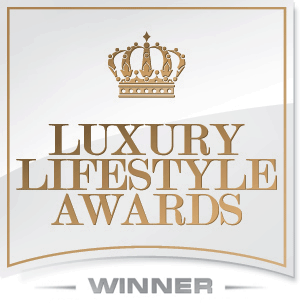 The area in front of the large living room is fitted with a fully furnished lounge area and a dining area. The dining area contains a large 3-metre table under a centuries-old olive tree. The area is also fitted with drapes to create a comfortable patio atmosphere. 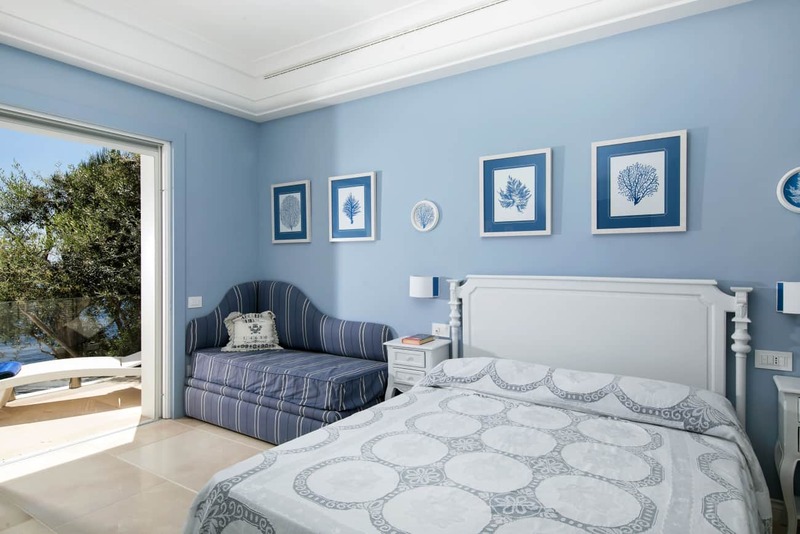 Bedrooms/Baths Description: THE UPPER FLOOR has a large terrace containing flower beds, from which you can access the bedrooms, which are all panoramic and furnished with taste and elegance. 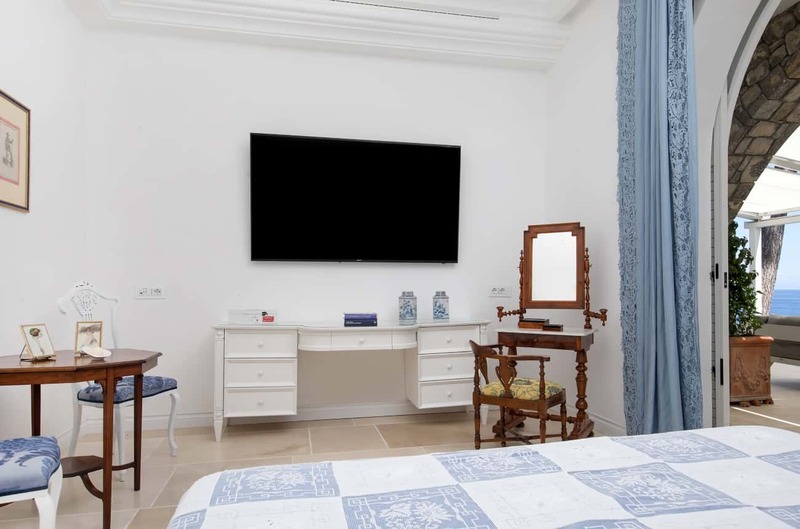 THE FIRST BEDROOM WITH EN SUITE BATHROOM has a double bed and a small single bed, a satellite television, a safe, minibar, air conditioning, and heating. 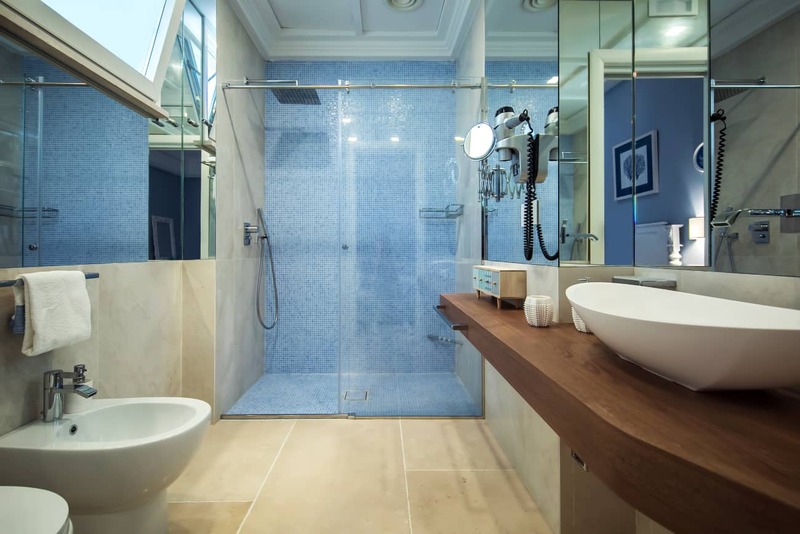 The bathroom is fitted with a sink, toilet, shower, magnifying mirror, hairdryer, and comes with complimentary bathroom products. 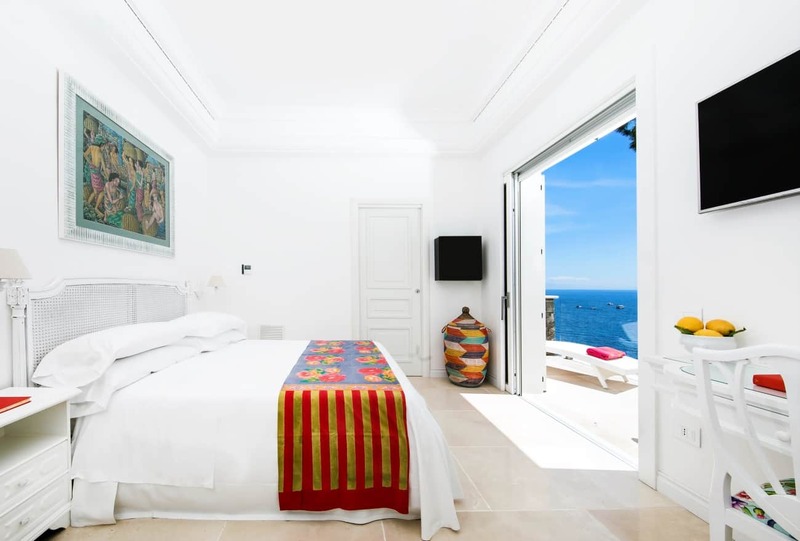 From the bedroom you will have access to a large terrace with a spectacular view of the sea and the “Li Galli” islands. Access to the bedroom is from the corridor. 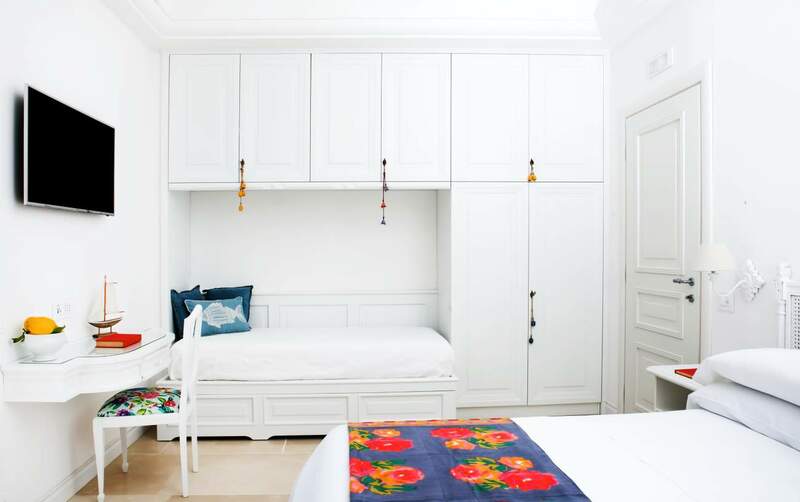 THE SECOND BEDROOM WITH EN SUITE BATHROOM has a double bed and a small single bed (with an extra pull-out bed), a satellite television, minibar, safe, cot, air conditioning, and heating. 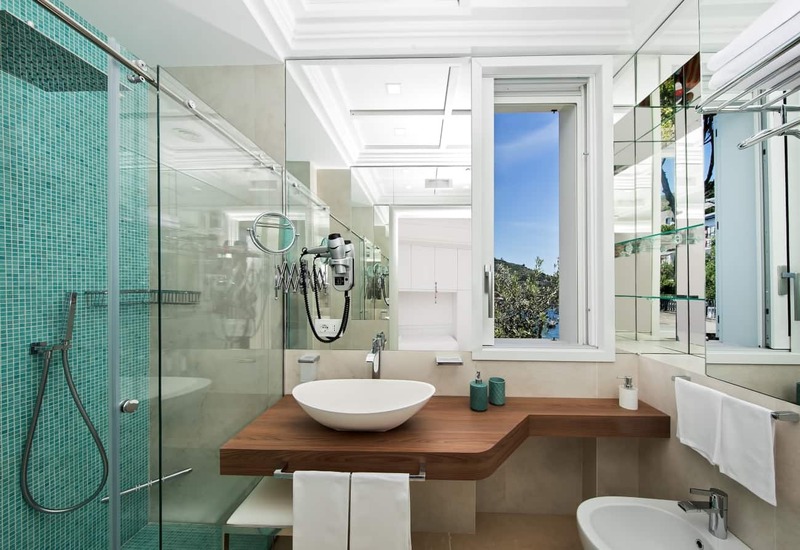 The bathroom is fitted with a sink, toilet, shower, magnifying mirror, hairdryer, and comes with complimentary bathroom products. 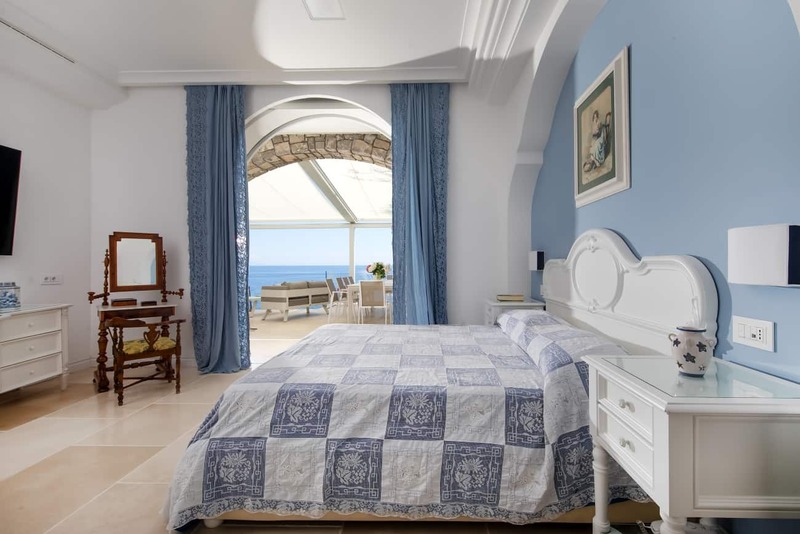 From the bedroom you will have access to a gorgeous terrace with a spectacular view of the sea and the “Li Galli” islands. Access to the bedroom is from the corridor. 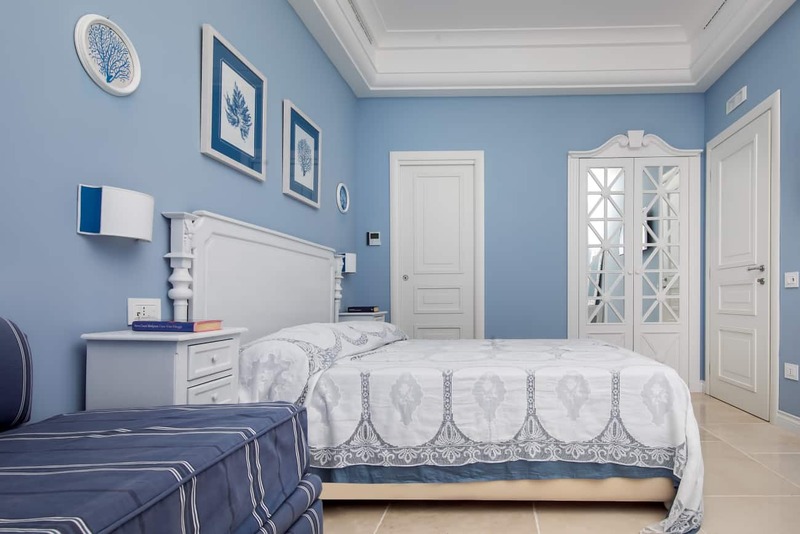 THE THIRD BEDROOM WITH EN SUITE BATHROOM has a double bed, a balcony with sea view, a satellite television, minibar, safe, air conditioning, and heating. 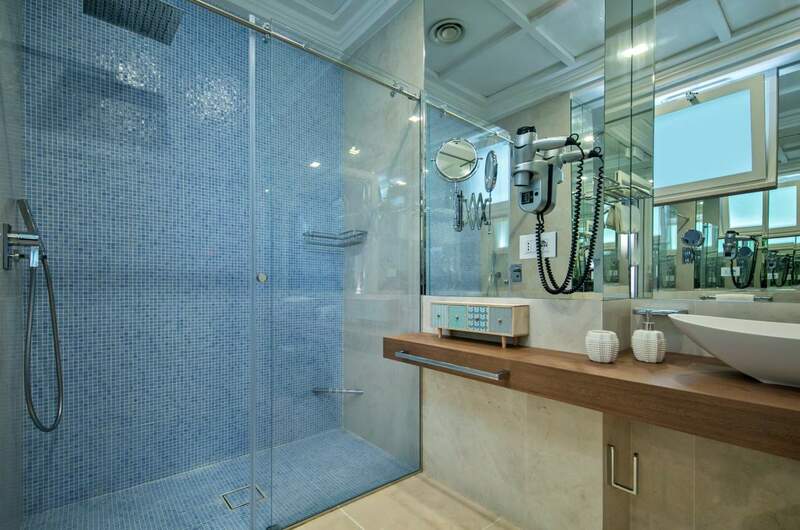 The bathroom is fitted with a sink, toilet, shower, magnifying mirror, hairdryer, and comes with complimentary bathroom products. You reach the bedroom from the corridor. Two cots and two children’s high chairs are available on request. GROUND FLOOR (reachable via the private lift or by climbing the stairs). 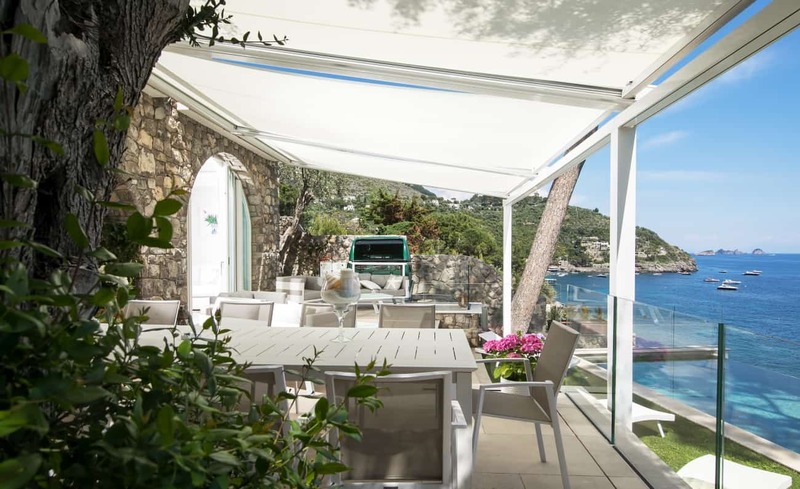 The outside area consists of a large terrace which surrounds the villa, decorated with flower beds which frame the various furnished outdoor areas (lounge area, dining area, masonry barbecue, and a wood-burning pizza oven). 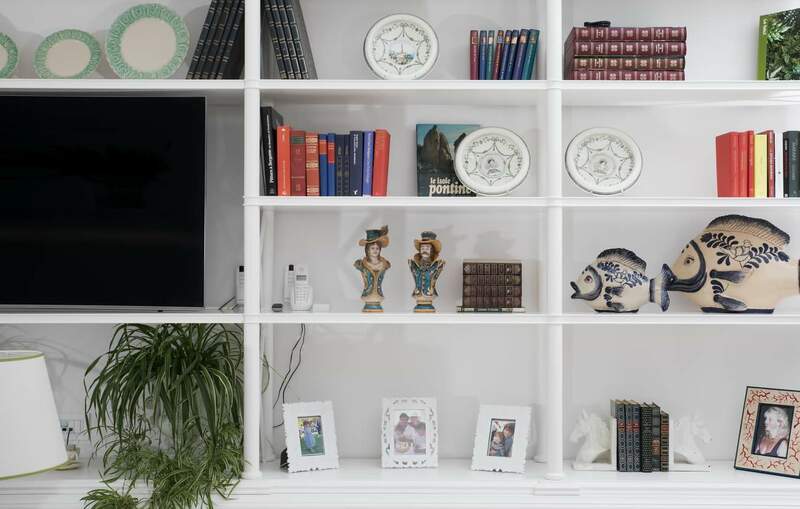 THE LIVING ROOM consists of a large and bright panoramic room with a lounge area containing a cabinet with 55” satellite television, and furnished with three elegant sofas, as well as a dining area containing a large table. The room, looking directly out over the terrace patio in front of the pool, is fitted with air conditioning, heating, and a telephone. 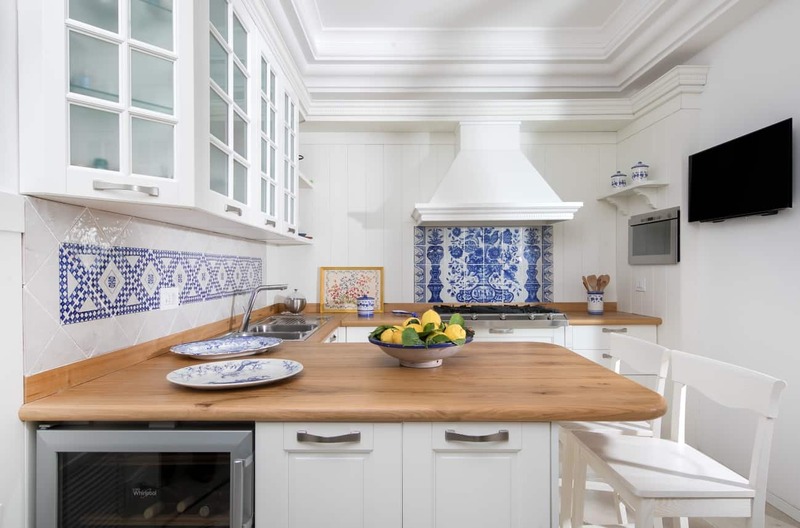 THE KITCHEN is fitted with a five-hob gas stove, an electric oven, a microwave oven, fridge-freezer, wine rack, ice machine, dishwasher, moka pot, americano coffee machine, toaster, electric kettle, and other small appliances. 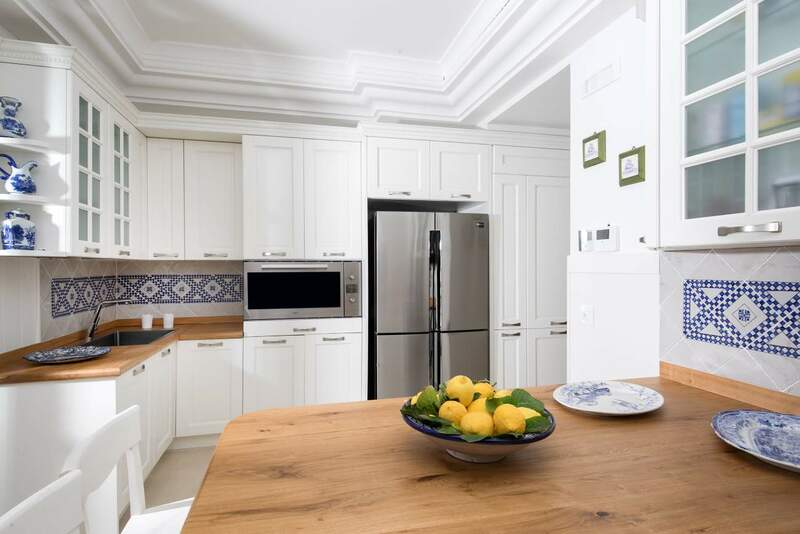 The kitchen is also fitted with air conditioning, heating, and a telephone. 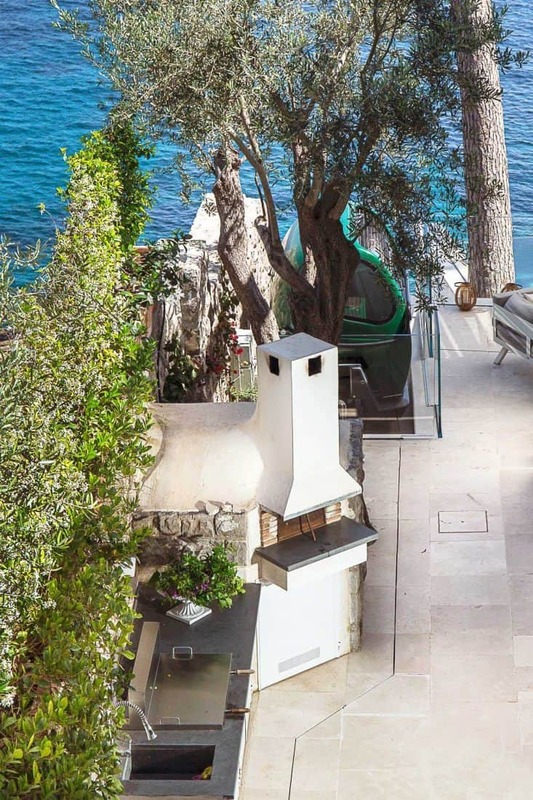 From the kitchen you can access the terrace fitted with a masonry barbecue and wood-burning pizza oven. Access to the kitchen is from the living room or the terrace. 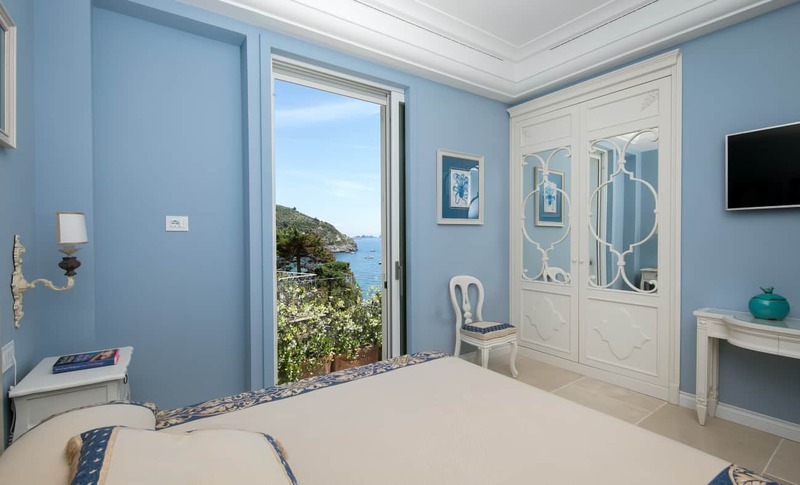 THE FOURTH BEDROOM WITH EN SUITE BATHROOM is spacious with a great panoramic view. It contains a double bed, a 70” satellite television, and is fitted with air conditioning and heating. 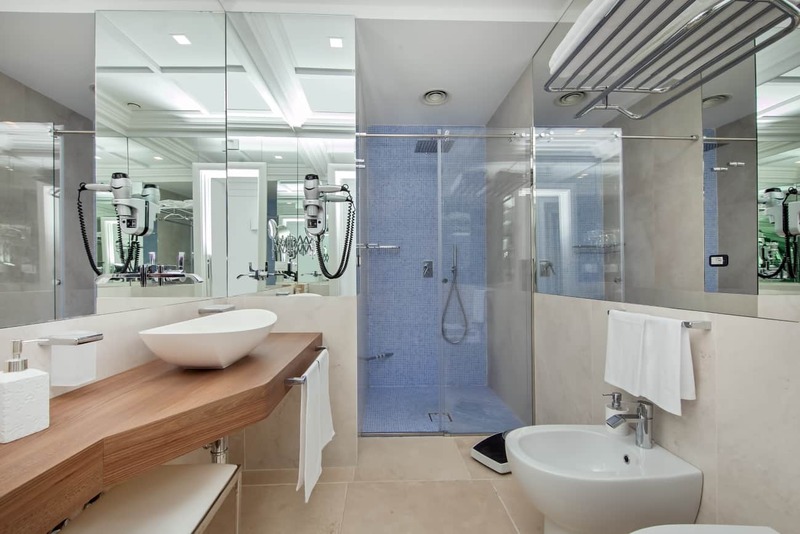 The bathroom is fitted with a sink, toilet, shower, magnifying mirror, hairdryer, and comes with complimentary bathroom products. 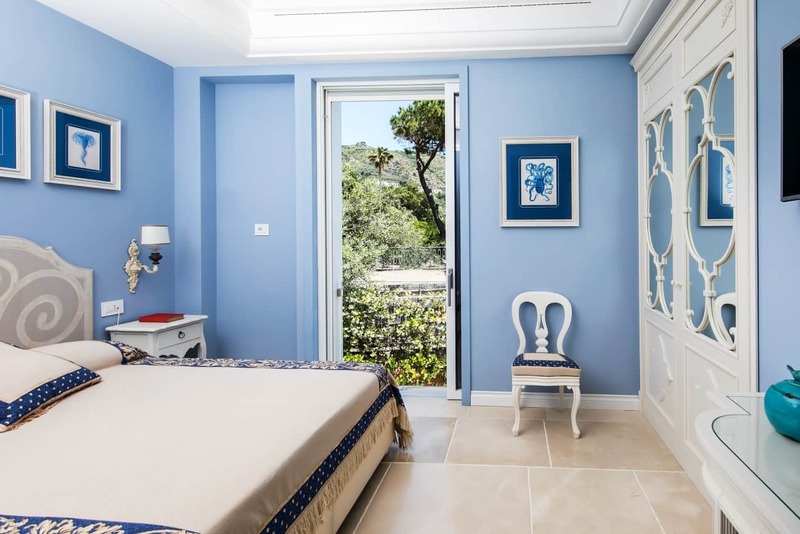 From the bedroom you will be able to access a gorgeous terrace with sea view. Access to the bedroom is from the corridor. THE GUEST BATHROOM contains a sink and toilet. Access to the bathroom is from the corridor. THE LAUNDRY ROOM is fitted with a washing machine and contains an iron and ironing board. Access to the laundry room is from the corridor. Here you will also find a bathroom. 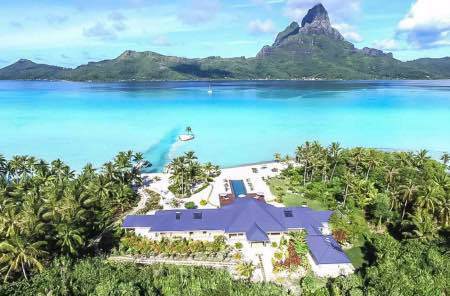 Outdoor Facilities: THE PRIVATE INFINITY POOL is positioned directly overlooking the sea, fitted with hydromassage seats, and is 3.9 m wide, 9 m long, and from 1.2 to 1.7 m deep. The grass border looking over the pool is furnished with sun loungers and fitted with a hot outdoor shower. 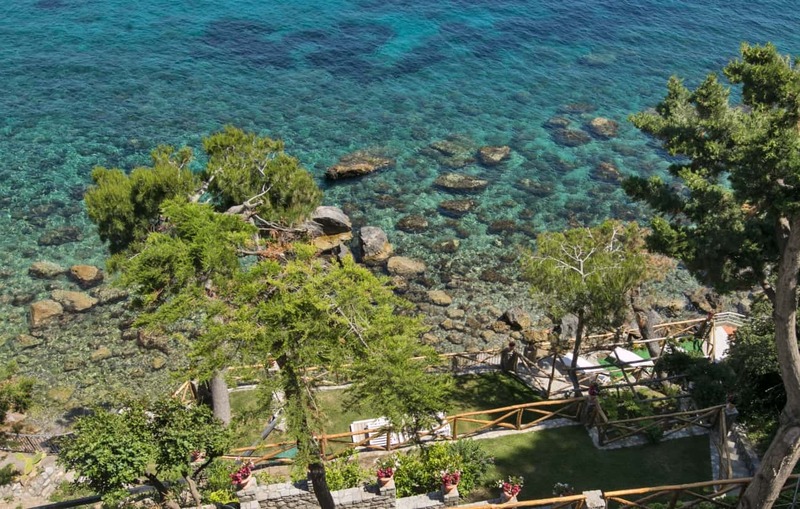 From the pool you’ll enjoy a spectacular view of the sea, Marina del Cantone, and the “Li Galli” islands. The pool is open from mid-April until the end of October and is accessed from the patio in front of the living room, up a wide staircase of just three steps made of Trani stone, which leads into the lawn garden overlooking the pool. 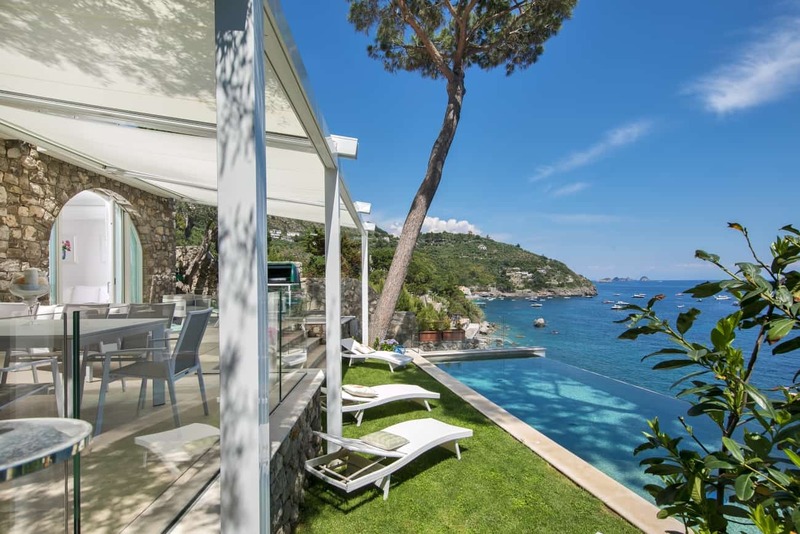 The terrace on the ground floor surrounding the villa is around 140 square meters in size. The area in front of the large living room is fitted with a fully furnished lounge area and a dining area. The dining area contains a large 3-metre table under a centuries-old olive tree. 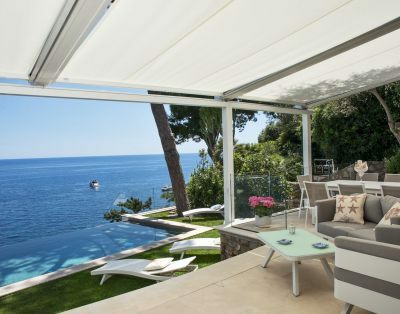 The area is also fitted with drapes to create a comfortable patio atmosphere. Policy: For arrivals after 19:30 PM will be applied an extra cost of 60, 00 Euros to be paid at the arrival.